Here it is the blind tasting episode. 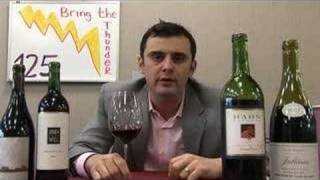 Can Gary Vaynerchuk be fooled? i know i’m a little late to be commenting on this blind tasting show qotd, but here goes…greatest discrepancy — and something that gives me a “i’m the (queen) of the world” rush everytime i think about it…bought at trader joe’s in southern california chateau potelle cabernet sauvignon 2002 for $20 bucks! sells on the chateau’s website for $60. i ran back to get more but, alas, they had no more; i must have appealed to my wine guy’s sense of compassion because he sold me a bottle out of his private stash. i rule. you guys had the dom p. 1995 rose for $115.00 at one point…my first order with WL was a 96 dom p., someone wrote me and said you guys were out, so i said send me the rose instead. well, you guys ended up finding the bottle i ordered and like 2 weeks later the 95 rose was up over $200.00. I wish I had ordered it. Also, the 96 dom p. that i bought for $115.00 is now a lot more expensive….i wish i had not drank it so soon, but champagne is awesome. 1. You don’t have to tape the selection and opening of the bottles. We trust you, and it’s boring. 2. Do it double blind. You mentioned that this was as double-blind as you could make it, but that’s not true. Chris behind the camera knew which wine was which, so that automatically ruins the methodology. He could have subconsciously and unintentionally given off cues and clues. It’s a well-known fact that when someone in the room with the test subject knows which is which (pill, wine, whatever), the results WILL BE affected. Mmmm, blind tasting… reminds me of the girl I used to date in college who always wanted to play around with bandanas. She was fun. Ah, quel morceau de queue! As they say… not me though, I don’t speak French. Everyone seems to be very impressed with your pick of the Petit Verdot. However, I’m wondering how you thought the Purple Angel was 88 pts and a pass but could tell it was a $40+ bottle? I thought that was something you could only tell by seeing labels (or price tags). It’d be great if you share what you identify as “quality” or costly even when you don’t think the wine is very good. A pretty interesting distinction. Good work! Paid $75 for a big bottle of Crown Royal at a large well respected wine store. An hour later walked into a shwag corner liquor store to see what they sold it for.. $50. Wanted to set the first place on fire. Also, have seen the Justin Isosceles for around $75 in a ton of store, then every once in a while it’s sitting on the shelf for $42 somewhere. Fun episode. Really enjoyed your nailing the Petit Verdot. Don’t think I would have. Your tasting or the Chilean wine that tasted like Syrah and wasn’t is a fault of the winery not your palate. 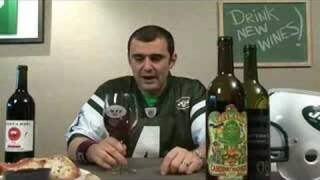 I purchased 6 cases of Vine Cliff 2001 Merlot for $14.00 a bottle. It was my sons Bar Mitzvah and I thought that would be a good Red Wine to serve. I bought it from a local wine store I won’t mention. I did some research when I got home and the cheapest I found it anywhere else was $29.00 with most of the pricing in the high $30’s range. Right place @ the right time. The distributor was closing it out since he lost that vineyard! Nice job, I rate your performance 89 points. I think MurphyGoode delivers some solid QPR with their wines and have traditionally been a big Nalle fan. I have several of their wines at the moment in the wine fridge i suspect. Have you heard from them yet regarding your review? QOTD – When i was 1st seriously getting into things I bought a ’98 Bahans Haut-Brion and right afterwards saw it significantly cheaper somewhere else – maybe 20% less. Not knowing better, I think i tried to ‘return it’ or somehow get a discount. I did get some break, but they were confused and i suspect annoyed. Just drank it recently, was still going strong. saw 1993 Mondavi Reserve Cab at Albertson’s for about $20 a bottle, on release and cleaned them out. Was going for about $60 in wine shops at the time. Still have a couple of bottles in the cellar. Probably the BIGGEST price difference was on the 2000 Louis Roederer Cristal. I saw it at this small little wine store in Rancho Santa Margarita, CA for $275 and have seen it everywhere else for around $350 and even $400 at a wine store in the Gaslamp District in San Diego. A difference of $75 to $125 is a HUGE difference. Fun ep this one. Repeat! QOTD: Biggest difference, … hm. Last I saw a 2004 Haut-Brion for â?¬ 169 while anywhere else it is around 260! Almost 100/bottle. Kiling. So my fingers itched, I nearly bought some. But then yeah, maybe I’d better wait till I can afford them really. Past QOTD. Saxum 2003 Broken Stones. Got it for $45. Saw it in another shop for $125 the same day. Oh man, I paid $79.99 for the Antinori Piam Delle Vigne Brunello ’96 at one of my favorite wine shops and the next weekend found it at this tiny place and got one for $29.99 no joke! At the 80 dollar price I thought it was crap and a rip off, but at $30 it was pretty decent. There still are alot of brunellos that are much better in quality and QPR (if there is such a thing in Italian red wine anymore). I really loved the blind tasting, it’s something you should do alot more often. Very impressive the way you were able to pick those defining characteristics in the wines. Keep up the great work! Loved the blind tasting. Can’t wait for another one! Something I paid too much for… forgot to cancel an extra hotel room I booked when I wine tasting in Santa Barbara a couple weekends ago, so I paid an extra couple hundred bucks for a sad old motel room! 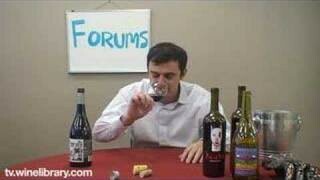 Please do another blind tasting like this in 2008. It was a lot of fun to watch. One of my biggest price discrepancy’s was not in wine. I noticed that a (typically) $100 sonicare toothbrush was listed at $0 on bloomindales website a few years ago…so I tried to order it thinking that the price would eventually be displayed. It let me order it at $0 and they had free shipping! I should have ordered 10 of them. QOTD: Bought a 2000 Torbreck Descendant from Barossa Valley for $56.99. Saw it on a couple of websites for $125-131. Great episode. Loved seeing the inside of your store at the beginning. Lot bigger than I imagined. Qotd: Yesterday I bought a case a Garretson Craic Syrah for $125 on closeout – it normally sells for $30 a bottle in Kansas City and Texas. I bought a few bottles of Turley Juvenile Zinfandel for $17 a bottle and I’ve seen it sold online for $45 a bottle. Sure, that’s only a $27 difference, but that’s almost 3 times what I paid for it.